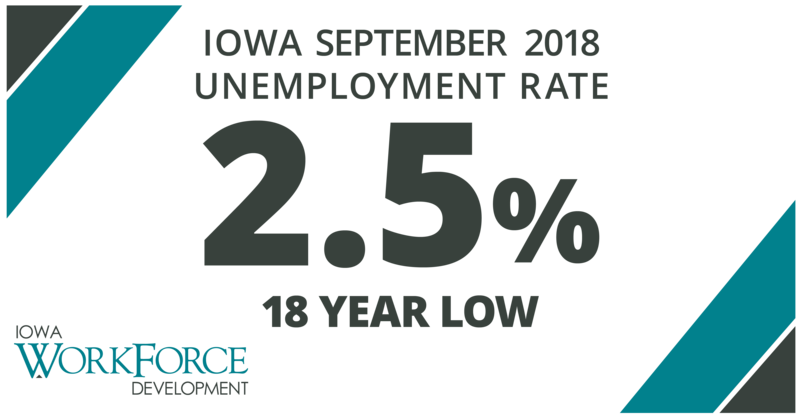 Iowa’s seasonally adjusted unemployment rate remained at 2.5 percent in September. The state’s jobless rate was 3.0 percent one year ago. The U.S. unemployment rate declined to 3.7 percent in September. The number of unemployed Iowans decreased to 41,800 in September from 42,700 in August. The current estimate is 8,200 lower than the year ago level of 50,000. The total number of working Iowans increased to 1,644,400 in September. This figure was 1,900 higher than August and 18,200 higher than one year ago. In September, Iowa establishments shed 3,400 jobs. This month’s drop marks the second loss in the last three months for the state. Both goods-producing and service industries took a step back this month. Private industry showed little overall movement this month whereas government pared 3,500 jobs and is now down 1,200 jobs annually. Of the ten private sectors: four super sectors lost jobs, four were unchanged, and two added jobs in September. Leisure and hospitality posted the largest drop in September (-1,100). This month’s loss is the second-consecutive drop for this super sector which has seen only three monthly increases in 2018. All of the loss this month was due to reductions in accommodations and food services which generally drives the monthly movements. Manufacturing posted a decrease this month (-600) following no gain in August. All other losses were small and included information services and financial activities, both of which shed jobs in August also. Alternatively, gains this month were highest in other services (+1,500). This sector has not shown any strong hiring trend this year. The only other sector to add jobs this month was professional and business services, gaining 500 jobs this month at the administrative support and waste management sector. Annually, total nonfarm employment remains up 17,600 jobs versus last September. Goods-producing industries continue to fuel annual growth and have contributed 14,300 jobs over the past twelve months. Durable goods factories are up 6,100 jobs despite little movement this month. Professional and business services also continues to expand and is now up 2,900 jobs since last September. Private sector losses have been limited to just three sectors: other services, leisure and hospitality, and information. 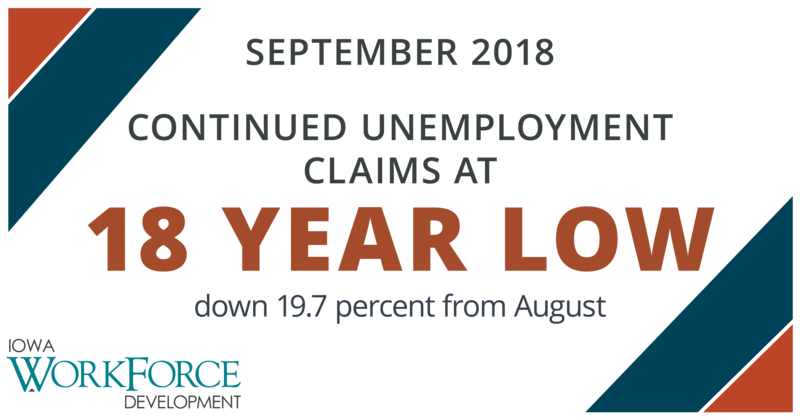 Visit www.iowalmi.gov for more information about current and historical data, labor force data, nonfarm employment, hours and earnings, and jobless benefits by county. MEDIA ALERT: Click here to access an audio cut of comments about Iowa's labor market situation. Local data for September will be posted to the IWD website on Tuesday, October 23, 2018. Statewide data for October 2018 will be released on Friday, November 16, 2018.